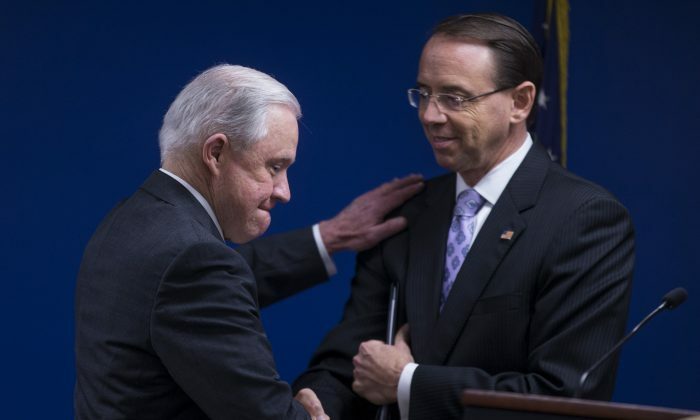 Attorney General Jeff Sessions said on Oct. 15 he had designated five groups, including Hezbollah and MS-13, as transnational criminal organizations (TCO), putting Deputy Attorney General Rod Rosenstein in charge of a task force to target the groups with investigations and prosecutions. The other groups on the list are the Sinaloa Cartel, Clan de Golfo, and Cartel de Jalisco Nueva Generacion. President Donald Trump has made fighting TCOs a priority, ordering the federal law enforcement “to identify, interdict, disrupt, and dismantle” them. Making Rosenstein the head of the task force appears to solidify his position within the administration. Trump talked to Rosenstein about the allegation on Oct. 8 and told media he had no intention to fire the No. 2 Justice Department (DOJ) official. The anti-TCO task force will have five subcommittees, each focusing on one of the groups. Assistant U.S. Attorney John Durham will focus on MS-13, a brutal gang with an estimated 10,000 members in the United States. Trump has often singled out MS-13, and the atrocities the gang perpetrates, to back up his calls for strengthened border security. The gang is based in El Salvador and not only are its members coming into the United States illegally, but it also recruits among the Central American youth streaming across the border in especially high numbers in recent years. Part of the U.S. Attorney’s Office for the Eastern District of New York, Durham “has played a significant role in the FBI’s Long Island Task Force, which has arrested hundreds of MS-13 members,” Sessions said. The subcommittee on Hezbollah will be led by Assistant U.S. Attorney Ilan Graff. Hezbollah, an Iran-backed terrorist organization based in Lebanon, is involved in drug trafficking throughout the Middle East, West Africa, Latin America, Europe, and the United States. It uses the drug money to finance its activities of terrorism and subversion. The Drug Enforcement Administration (DEA) ran an operation called Project Cassandra against Hezbollah starting in 2008. The operation discovered that the terrorist group was raking in an estimated $1 billion a year from weapons trafficking, money laundering, drugs, and other crime. But the Obama administration “derailed” the operation, Politico reported in 2017. Graff oversaw the prosecution of two alleged members of Hezbollah’s External Security Organization, “the first such operatives to be charged with terrorism offenses in the United States,” Sessions noted. Graff works at the U.S. Attorney’s Office for the Southern District of New York. His subcommittee will be led and staffed by members of the Hezbollah Financing and Narcoterrorism Team, which Sessions set up in January. “This team is composed of experienced international narcotics trafficking, terrorism, organized crime, and money laundering prosecutors who are tasked with investigating individuals and networks providing support to Hezbollah,” Sessions said. Trial Attorney Brett Reynolds will handle Cartel Jalisco Nueva Generacion. Working at the DOJ’s Criminal Division, he has helped secure indictments of some of the cartel’s highest ranking members. The Sinaloa Cartel will be targeted by Assistant U.S. Attorney Matthew Sutton of the U.S. Attorney’s Office for the Southern District of California. Sutton prosecuted several Sinaloa kingpins and led international investigations of Sinaloa leaders. Assistant U.S. Attorney Robert Emery will lead the charge against Clan del Golfo. He’s previously secured convictions against the top leaders of the cartel. He works at the U.S. Attorney’s Office for the Southern District of Florida.